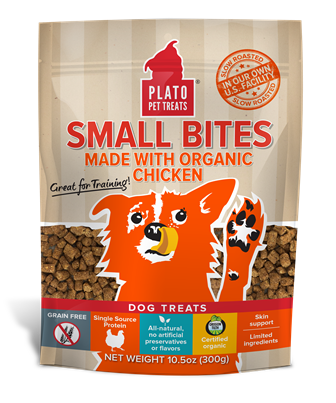 Plato Small Bites – Made with Organic Chicken have NO added sugars, artificial preservatives, by-products, artificial colors, or protein-meals. These training treats are completely grain-free, soy, wheat, corn, fillers, and gluten free. Slow Roasted in our very own US facility to maintain maximum nutrition, never freeze-dried. These single-source novel protein treats are especially good for overweight or small dogs, or dogs with skin issues, allergies, and food sensitivities. Flavors include duck, salmon and organic chicken. Product is available in 300g and 4oz sizes.